A private high school in Sirsi, in northern Karnataka is not stopping at imparting academic education. 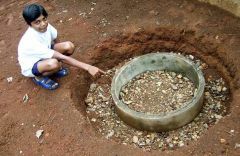 It has also started teaching practical water literacy to the people of five Malnad districts. The rain centre at the school, with 28 examples of rain water harvesting, opened in early June. Shree Padre reports. This private high school, Neernalli Madhyamika Shikshanalaya at Neernalli, seven kilometres from Sirsi, district headquarters of Uttara Kannada in Karnataka will play a double role henceforth. Apart from imparting academic high school education, it will teach water literacy to the people of adjoining five Malnad districts. From early June, the school has started hosting the Malenadu Male Kendra - Kengre (MMKK), first of its kind and a one-stop information clearinghouse for rural rainwater harvesting in the country. In and around the school there are 28 models of water conservation and RWH. Infiltration pit, contour trench, staggered trench, open well recharge, bore well recharge, gully plug, recharge through termite hills, roof water usage and educative demonstrations like measuring rain, leaky taps, tippy tap, etc., are some among them. Adjoining the playground, there is a percolation tank to which all the run-off from the former would go. The name board says that it's the 'water vessel' of the hamlet. Shivanand Kalave, a development journalist and RWH activist is the brain behind this project. A model for ground water recharge that's popular locally. Pic: Shree Padre. Apart from the models, MMKK includes a few real and working RWH structures that are not used for teaching. A serious student of water conservation can see many interesting structures in a half an hour drive from Neernalli. These include Johads, tanks of Sonda constructed in 8th century, a unique traditional check-dam constructed by Sheeliga community that allows the wooden logs to escape from above during rainy season. There are many 'tell-tale' spots that can impart the lesson of afforestation, problems of monoculture, natural regeneration, how soil erosion can be checked by facilitating growth of grass all around etc. Of course, there should be an experienced guide to explain these lessons to the visitors. With Kalave around, you get many interesting insights about biodiversity, forest development, ill-effects of deforestation etc. Kalave is an impressive communicator. He has been spreading awareness about RWH in the state since the last five to six years. His studies of the relation between forest and water and the need for biodiversity are so impressive that even forest officials invite him for slide-shows for their own staff. "What's the size of the infiltration pit we have to dig?" "At what distance from the well we have to dig the pit?" "Are there any persons in our area who are harvesting rain wherefrom we can see and learn?" "What are the filter media that we have to fill the pits with?" Questions asked by citizens on rain water harvesting, addressed by Shivanand Kalave and the rain centre. After the RWH slide-shows, Kalave was getting many queries like: "What's the size of the infiltration pit we have to dig? ", "At what distance from the well we have to dig the pit? ", "Are there any persons in our area who are harvesting rain wherefrom we can see and learn? ", "What are the filter media that we have to fill the pits with?" and so on. Shivanand felt that just showing the 'real' photographs in slide-shows was not enough. There should be a centre where all the models are shown from where people could 'see and learn'. There was another development in the recent years that catalysed the dream of the rain centre into reality. Four years ago, Kengre river, 13 kms away that was supplying water to Sirsi town started drying up in summer. Municipal authorities decided to construct a big dam in Kengre river to supply water to Sirsi. This would have adversely affected the local farming community. The dam would cut off the flow going downstream. Farmers organised themselves and started vehemently protesting this. "Don't play with our livelihoods by constructing the dam here. Desilt the tanks at Sirsi, start harvesting rain there," these villagers told the municipal authorities. Many meetings, heated arguments followed. Finally proposal for the dam was withdrawn. Once the initial heat subsided, Kalave felt that the path of confrontation does not bring solutions. Instead, he thought, it would be better if Sirsi citizens are made aware about self-help regarding water. Consistent efforts motivated 300 families to take up open well recharging on their own. Most of the lodgings in the town are harvesting water in a big way. Thanks to Shivanand's painstaking campaign, RWH has caught up in Sirsi now. "We dreamed of the rain centre without a penny in our pocket," recalls Shivanand. Absence of a rain centre was a bottleneck for the movement. Kalave explained his dream in December 2004 to local MP, Ananthkumar Hegde. Convinced about the concept, Hegde gave Rs.2 lakhs from his fund. Subsequently, Madyamika Shikshana Samithi, the trust that runs this school patted his back with Rs.50,000 and offering its 5-acre location to develop the rain centre. The display board and information posters were sponsored by Forest Department and the local Kanara District Co-operative Credit Society bank. It is refreshing to note that including the beneficiaries of Shivanand Kalave's RWH campaign, government departments and organisations have joined hands in making this dream into a reality. How much rain falls on a sq.meter area? Pic: Shree Padre. Students and teachers of this high school are now being taught to impart water literacy to visitors. Interestingly, the methods that would be shown here in relevant to whole heavy rainfall area of Malnad comprising of Uttara Kannada, Dakshina Kannada, Udupi, Chikmaglore, Kodagu and Shimoga. Shivanand cautions about the importance of water harvesting in this otherwise forested part of Karnataka. "In Malnad, there should be a tank above the arecanut gardens. A devara kadu (sacred forest) in its catchment has to support this tank by percolating the rainwater into it and protecting it from silt. Unfortunately, our betta lands (upper hillocks adjoining the gardens) have turned barren. Unless and until they develop canopy cover, our life won't be sustainable." "The urban-rural conflict of ours clearly made us realise that we need to make serious efforts to educate our people, may they be urban or rural. After all, nobody can live without water, you see," points out M S Hegde, Chairman, MMKK. "So, we thought 'showing by doing' is the only way that will catch public attention. Our rain centre is the result of three years preparation. In the meantime, we were successful in grooming hundreds of ambassadors of RWH, who are eager to share their success with fellowmen." The Sirsi zilla panchayat CEO S G Shivananda Moorthy has clear plans to utilise the rain centre. Says he, "We will encourage all the schools and colleges to take students teams to the centre under the leadership of one or two interested teachers. Our gram panchayat members and officials would have a clear cut idea of what RWH is by seeing all the models and taking a round in the nearby forests. Such lessons are very difficult to understand without seeing a live model. We're bringing out a monthly newsletter by name Grameena Bharatha from the district panchayat. Henceforth, we will keep one page for soil and water conservation, success stories and lessons from Malenadu Male Kendra." V Vijay Mohan Raj, Deputy Conservator of Forests, Sirsi is happy. "We have 133 grama aranya samithis in about 100 villages. Our district Uttara Kannada has forests covering 40,000 hectares. But unfortunately, these are in very serious degradation. We have already initiated many soil and water conservation measures including construction of new johads inside the forest. For us, the rain centre is very handy to boost up the interest of farmers and to make them understand the relation between forest, soil and water. If more and more local people understand and start acting towards the conservation, it is good for our forests." Shivanand Kalave. Pic: Shree Padre. Shivanand says that each day, they, the water activists get so many phone calls asking how RWH can be done at their house or field. "This is really laudable because these are the persons who are ready to do it without government subsidy. At the same time, it is really ironical that just for the want of clear guidance or moral support, thousands of people are not being able to harvest rain. Our state government has to take serious note of this and if not anything else, take immediate steps for mass education in water conservation." No doubt, initiatives like this rain centre by local communities maybe one in each district, would catalyse water literacy considerably. An 'H2O House' is the second stage dream of MMKK. (H20 is the chemical name of water). Elaborates Shivanand, "It will be a typical tiled Malnad house with roof water harvesting, solar lighting, grey water reuse, kitchen and all the hands on eco-friendly techniques incorporated. It will have an LCD projector, a library and meeting hall with staying facilities for 50 people. Visitors will have a real life experience in drinking rainwater and using and forming an opinion about all these simple, but sustainable systems." The estimated cost of 'H2O House' is Rs.40 lakhs. MMKK is seeking voluntary contributions by public and private organisations for this purpose.